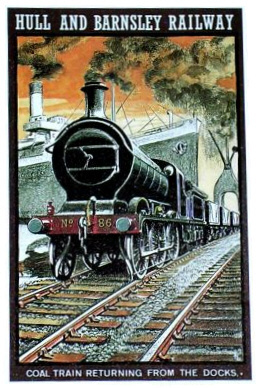 The Hull & Barnsley Railway (H&BR) was born on 26th August 1880, out of a desire by the city fathers and merchants of the port of Kingston Upon Hull to break the monopoly which the North Eastern Railway (NER) exercised over the city. The NER was perceived to be favouring other ports further north for their timber trade, notably the Hartlepool's. Meanwhile the coal trade at nearby Goole and Grimsby was depriving Hull of further coal trade. The City fathers particularly wished to challenge the NER by exercising greater control over Hull's access to both the lucrative Baltic states timber trade and the Yorkshire coalfields export markets. The need for a new railway line with larger more modern dock facilities capable of handling increased timber and coal traffic was therefore established, being envisaged as the means to increase the prosperity of Hull. Two previous schemes for such a line, one from 1845 the other from 1862 had fallen by the wayside. The ideas behind these schemes were eventually amalgamated to form the successful H&BR proposal, passed in Parliament on 26th August 1880. Work on the building of the line commenced immediately and Alexandra Dock was opened to shipping on 16th July 1885, the railway opening four days later to goods traffic and to passengers a week later on 27th July 1885. "The Hull, Barnsley and West Riding Junction Railway and Dock Company" as it was originally known, was the last large independent Victorian railway construction scheme in the UK apart from that of the Barry Railway. The railway was initially beset with problems, it was argued strenuously against by the NER right through to the Parliamentary Committee stage. The railway was also beset by dissension within Hull between the owners of the Hull Dock Company, the promoters of the rival scheme "The Hull & Huddersfield Railway" and other railway companies and subscribers to the "Humber Agreement". The "Humber Agreement" was comprised of the Manchester Sheffield & Lincolnshire; London North Western; Lancashire & Yorkshire; and NER railway companies who were interested in defending their access arrangements between Hull and Grimsby in the east; and Manchester, Liverpool, Ashton and Stalybridge in the west. The Hull & Barnsley Railway line ran independently for thirty seven years before being finally absorbed into the NER on 1st April 1922 as a direct preliminary to grouping and the formation of the LNER on 1st January 1923. There was a substantial complex of branches and connections to other railway companies as well as joint working arrangements to be found at the western end of the line. Thank you to John Broadwell for the above history. 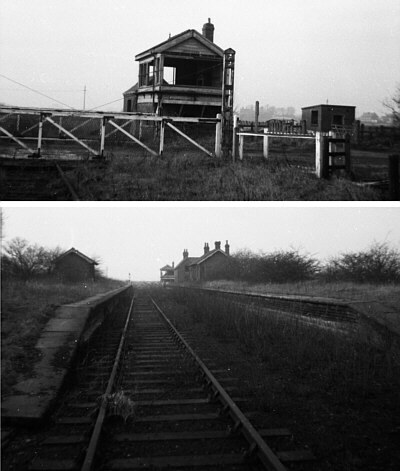 Thank you to Richard Barron for the above photographs of Barmby-on-the-Marsh station & signalbox.